Ready for the world's biggest water fight? Here's everything you need to know about Songkran, Thailand's New Year's Festival. Songkran is the most famous festival in Thailand, attracting thousands of people from around the world to its lively celebrations. An important date in the Buddhist calendar, the festivities mark the start of the traditional Thai New Year. Songkran takes place between 13th and 15th April every year and lasts for three days. These dates were the official date of the new year in Thailand until 1888 when the date was moved to 1st April. The date was then shifted again in 1940 to the Western 1st January, although Songkran remains a public holiday across Thailand. Where does Songkran take place? Although most people know it as a Thai celebration, in actual fact Songkran is celebrated across South East Asia. Neighbouring Laos, Cambodia and Myanmar celebrate the festival, as well as Sri Lanka, parts of India, China and Vietnam. How do you celebrate Songkran? Although you might think Songkran is simply one big water fight, that's not what the festival was about originally. Traditionally, it's a celebration that symbolises purification where people can wash away their sins or bad luck from the previous twelve months, ready for the new year. For many Thais, Songkran means heading back to their hometowns, spending time with their family and visiting temples. Wherever they celebrate, people across Thailand grab buckets, bottles and water pistols and hit the streets to take part in the world's biggest water fight. Where's the best place to celebrate Songkran? That depends on what kind of Songkran celebrations you're looking for, but it's safe to say that wherever you are in Thailand you'll be able to enjoy the festivities! One of the most popular places to experience the magic of Songkran is the northern university city of Chiang Mai, which is transformed into one giant water fight for the entirety of the festival. Celebrations here can last up to six days and are often the most riotous in the country so it's well worth the visit! Many of Thailand's popular southern islands are also great places to soak up the Songkran vibes, with Phuket's lively Patong beach area transformed into a heady three-day street party that attracts people from around the country. For a family-friendly Songkran, go to ancient Ayutthaya where more traditional festivities take place amongst the ruins of the ancient Siamese capital. Alternatively, head to a temple and experience a more sedate Songkran in the company of Buddhist monks. Can you celebrate Songkran in Bangkok? Yes! 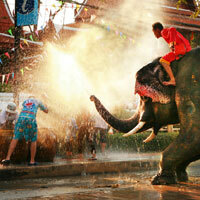 The effervescent capital of Thailand is a great place to enjoy Songkran. As many locals head back to the provinces for the three-day holiday, the capital is oddly quiet during Songkran, but there's still plenty of fun to be had! Foreigners flock to the backpacker haven of the Khaosan Road but there are parties across the city that cater for every taste, from temple ceremonies to music festivals. And if you don't want to get wet, Bangkok is probably your best option for a dry Songkran. Of course! Thailand is an excellent country to visit throughout the year but Songkran is a great time to see the locals really let their hair down! If you decide to visit any temples during your Songkran experience, remember to follow local customs and traditions and act respectfully at all times. The most important thing to remember when heading to your first Songkran is to simply go with the flow! It will be impossible for you to even step out of your hotel without encountering local revellers and you won't be able to resist the festivities for long. However, don't forget you're visiting a foreign country with its own customs and laws that you should respect at all times. Dress conservatively when visiting rural areas and temples and avoid getting drunk in public as this will be frowned upon by locals and could see you falling on the wrong side of the law. Keen to join the festivities in Thailand? It's essential to get the right travel cover. At World First we offer dedicated travel insurance for holidays in Asia that'll give you peace of mind when exploring unforgettable Thailand.